Jalebi: Jalebi, or Jilapi, or Jilawii is a sweet popular in countries of the Indian Subcontinent such as India, Bangladesh, Nepal, Pakistan and Sri Lanka, and in many countries in the Middle East and North Africa. It is made by deep-frying a wheat flour or maida flour batter in pretzel or circular shapes, which are then soaked in sugar syrup. They are particularly popular in the subcontinent during festivals of Ramadan and Diwali. Whisk all purpose flour, yogurt and sufficient water to a smooth and pouring consistency batter, in a large bowl. Cover the bowl with batter with a clean cotton cloth. Keep the bowl in a warm place, to ferment, for 24 hours. Whisk the batter with your hands for 15 minutes. Add in the yellow food colouring. Whisk again, till the colour in incorporated into the batter. Cook sugar with 1 cup water in a deep non-stick pan on high heat, stirring continuously, till the sugar dissolves. When the scum rises to the top of the sugar syrup, collect it with a ladle and discard. Add in the saffron strands. Cook the sugar syrup, stirring continuously, till the syrup reaches one string consistency. Remove the sugar syrup from heat and keep it warm. Heat the oil, for deep frying, in a kadai on medium heat. Pour a ladle of batter onto a jalebi cloth (thick cotton cloth, with a hole in centre). Gather the edges of the batter and make a tight potli (swag). Squeeze round spirals of batter into the hot oil. Deep fry the jalebi’s, turning them over gently a few times, till they are evenly golden and crisp. Drain the oil from fried jalebi’s. Transfer them to the warm sugar syrup. Soak in sugar syrup for 2-3 minutes. Take the Jalebi’s out of the syrup and serve hot. 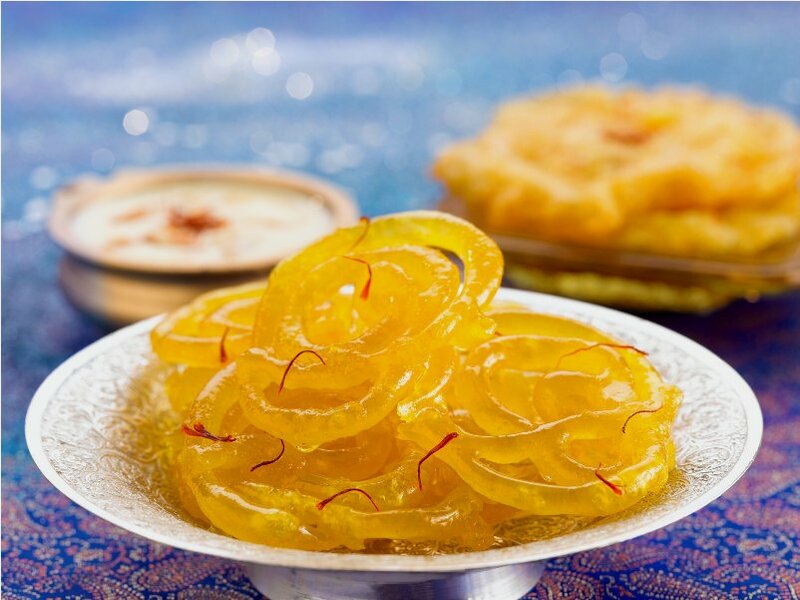 If you have any queries regarding the Jalebi recipe, please leave a comment.